Flip the device over to let the liquid drain away from crucial components. Immediately remove all sources of power from the device such as the charger/adapter and battery (as long as safe to do so). Do not attempt to turn the device back on until you are 100% sure the device is completely dry and clear of any residue left by the spillage. If the liquid is anything other than water you should have the computer or device looked at by professionals who can disassemble the device and clean any residue and improve the chances of survival. I can't stress highly enough the importance of removing all power immediately from the device. 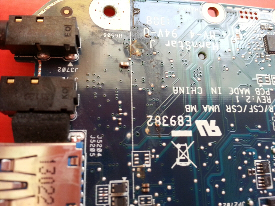 If you act quickly enough you may be able to stop the liquid before it bridges two points on the PCB (printed circuit board) that should never connect (as seen in the image below), as such a connection is likely to be fatal. Safe computing everyone.